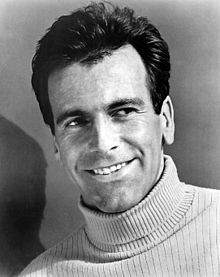 Maximilian Schell (8 December 1930 – 1 February 2014) was an Austrian-Swiss actor. He won the Academy Award for Best Actor for his role in Judgment at Nuremberg in 1961. He was also a writer, director and producer for some movies. He was also nominated for a Golden Globe Award for his role in Stalin. He also appeared in Abraham, Deep Impact, Coast to Coast, and in The Brothers Bloom. His sister was actress Maria Schell. Schell was born on 8 December 1930 in Vienna, Austria. He was raised as a Roman Catholic. He studied at the University of Zurich. His father was Swiss. Schell began acting at the Basel Theatre. Schell's career began in 1955. His movie was Kinder, Mütter und ein General. He then appeared in two other movies until he bagn his role as Hans Rolfe in Judgment at Nuremberg in 1961. His role as Hans brought him great fame and success. He won an Academy Award and Golden Globe Award for Best Actor. Schell then appeared in other big picture movies that earned him nominations for an Academy Award. He was nominated for his role as Arthur Goldman in The Man in the Glass Booth, for his role as Johann in Julia. He then won a Golden Globe Award for Best Supporting Actor in 1992 for his role as Vladimir Lenin in the movie Stalin. Afterwards, Schell then directed a television movie Candles in the Dark. After his win in 1992, Schell then appeared in many television movies. In 1998, Schell appeared as Jason Lerner in the 1998 movie Deep Impact. His last role was in the 2008 comedy movie The Brothers Bloom as Diamond Dog. Schell married Natalya Andrejchenko in 1985. They divorced in 2005. Then in 2013, Schell married Iva Mihanovic. Schell never had children. Schell suffered diabetes. He was good friends with Leonard Bernstein. He performed with Claudio Abbado in many performances. His sister Maria died in 2005 from pneumonia. Schell was a guest professor at the University of Southern California. He was awarded an Honorary Doctorate from Spertus Institute for Jewish Learning and Leadership in Chicago. Schell died on 1 February 2014, in Innsbruck, Austria after a "sudden and serious illness". The German television news service Tagesschau reported that he had been receiving treatment for pneumonia. Schell was 83 years old when he died. ↑ 1.0 1.1 1.2 "Oscar-Winning Actor Maximilian Schell Dies at 83". Associated Press in the New York Times. February 1, 2014. Retrieved 2014-02-01. Schell's agent, Patricia Baumbauer, said Saturday he died overnight at a hospital in Innsbruck following a "sudden and serious illness," the Austria Press Agency reported. This page was last changed on 29 November 2018, at 11:10.